Please don’t be bored or think that I am bragging. I just wanted to post one more photo of the sugarhouse, under steam and looking beautiful…at least to me 😮 I am very proud of this little sugarhouse and for all that it stands. I am sure that I should have my hands laid to this job, because it makes my soul soar. My memories of my grandparents and parents making maple syrup are few, but very sweet. My grandparents were killed in February 1969. The sap buckets were half washed and equipment was ready to go as they prepared for the syrup season that never came … I was ten years old. I knew that one day, I too would make maple syrup. I have been doing it for years now, but every year my sense of purpose gets even “sweeter”. I look forward to this season more than a vacation. The days can be long. The work can be hard. I get very tired at times and yet I wouldn’t trade it for anything! I like to share the maple experience with family and friends. It is a purpose for which I was born. Some would probably snicker about my little old sugarhouse in the valley, but to me it is a cathedral in the woods… God speaks to me there. The steam fills the room almost as much as my happiness. 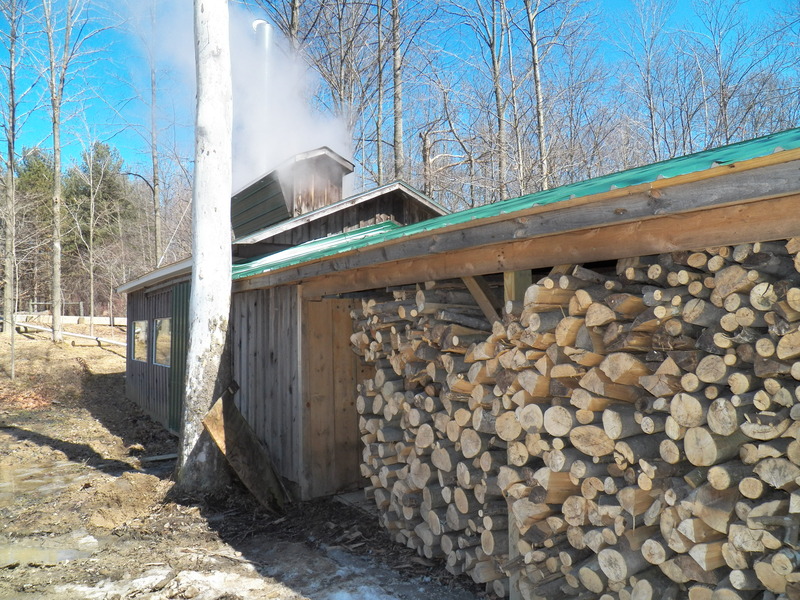 Memories flood in while, the water vapor yields the sweet concoction we call maple syrup. The process amazes me. The old-fashioned way that I go about making the syrup pleases me. After all, it’s not everybody who uses draft horses to help gather the sweet, clear sap. I plan to make maple syrup as long as I am able. Perhaps one day my equipment will be all ready to go, when I cannot, like that fateful day in 1969. My hope is that on that day, I will have instilled the knowledge, the experience and the love of the job in my children and grandchildren. The steam will continue to rise from the cupola, the fire will burn bright in the arch and sweet memories will be made on this farm forever.